Our lash experts can customize the finished results based on your preferred style with single or 3D extensions for either a more subtle or dramatic look. Each lash is meticulously placed individually on your own lashes so they look natural, fuller and thicker. We use a special adhesive designed for eyelash hair that will give your extensions bounce and flexibility – just like real eyelashes. 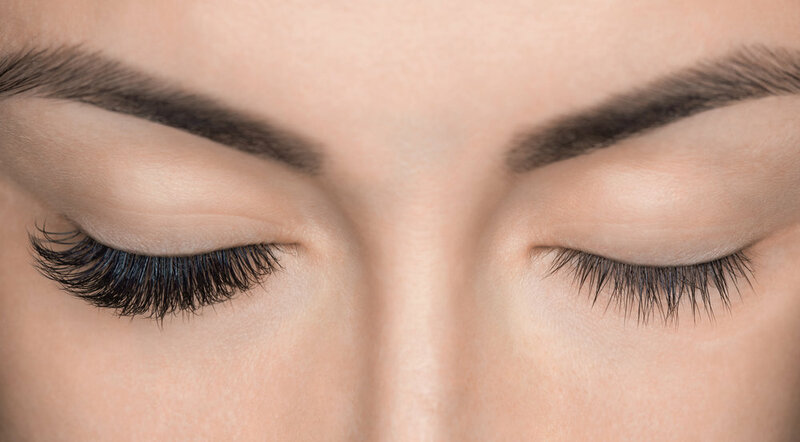 The eyelash extensions can last up to 2-5 weeks with proper care. Our lash extensions are perfect for everyday or special occasions. Sit back, relax and enjoy the lash nap! Our classic full lash application adds a natural enhancement using single lash extensions. The result is a soft yet fuller look. Lashes are applied individually to your natural lashes and are soft and fluffy. Add some drama to your life with a little more than just a classic look! We mix classic lashes with 3D volume lashes to add a little more depth and fullness to your desired look, keeping your lashes weightless and comfortable. Let us gently and safely remove your lashes when you are ready for a new set. This treatment allows us to remove your lashes in the safest and most comfortable environment so we are able to maintain the integrity of your own lashes. Want to give your lashes a break from extensions? Magnetic lashes are the greatest! Take them on and off whenever you want, no glue, no fuss, easy to apply for those days when you want the lashes without the hassle! Providing fashion, style and personalized looks for every day, glamour, and bridal makeup. Made in Italy, Eva Garden Makeup inspires a trendy, fresh, refined and colourful experience, in a space in which our guests can find the proper advice and products they are looking for. Our Makeup Boutique is a space dedicated to anyone that loves the excellence of high quality, ingredients made from all natural sources. Ingredients that are derived from the most sought-after minerals, vitamins and advanced scientific anti-ageing technology, that are smudge free, hypo-allergenic and hydrating, all while stimulating collagen production. Eva Garden makeup is never tested on animals. Come and experience the highest standards of cosmetic ingredients in the world with our professional makeup application! Perfect for an upcoming event or special occasion, we can create a look that suits your style and comfort level. Our professional makeup artists are on trend with up to date makeup techniques that will enhance your natural beauty for any occasion. Bliss Brides are the most beautiful brides. We will help create an immaculate look that will have your guest turning their heads on your special day! Visit our Bliss Brides section for full package details and wedding prep services, from skin treatments, nail care and makeup application for the entire wedding party. Enhance the natural colour of your lashes using tints to darken and add depth. Safely used with vegetable dye, this application is great for those who need to add some colour or want to avoid the use of mascara. Add the appearance of depth to your browns, cover up those pesky greys with an eyebrow tint. Make your morning routine a little quicker and easier with a lash lift! Designed to create the appearance of longer lashes, this treatment is great for those who have naturally straight or flat lashes or for those who want to enhance their lashes by making them pop! Lash lifts can be done alone or with a lash tint for a more dramatic look.